Stuart Watkiss signed yet another new player today when he reeled in Terry Fleming from League 2 side Grimsby Town. 32yr old Fleming was released by the Mariners at the end of last season after just one year on Humberside and has now signed the usual 12 month deal with us. He has previously played for Coventry City - where he started his career, Plymouth, Lincoln, Preston NE, Northampton and Cambridge United. 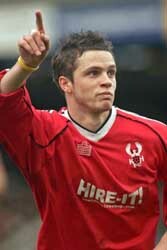 It's not sure wether Grimsby fans really liked him or not. His nickname of 'The Black Zidane' has given him folklore status up North and, when asked, comments from their message boards were that he gives 100% but has a problem in passing the ball. Again, we'll have to see for ourselves but meanwhile there's an irreverent website for him here. At the same time that Fleming was arriving at Aggborough Towers want away striker, Chris Beardsley, was off up the M42 to Mansfield to sign for next seasons relegation favourites, Carlton Palmers Mansfield Town. Shame how some people reward managers that resurrect their careers.